Reiko Iitsuka is the newly appointed Senior Advisor for Asia-Oceania of the Ramsar Convention on Wetlands, officially assuming her role at the Secretariat on 20 August 2018. 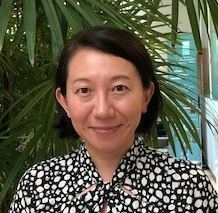 Reiko holds a BA in Business administration from Hosei University in Japan, a Master of Environmental Management and a Master of Forestry from Duke University in the USA. Before coming to the Ramsar Secretariat , she served as Technical Advisor at the Global Environment Department of the Japan International Cooperation Agency (JICA). She has been working in the environment and international development arena for over 10 years in various organizations including the World Bank, UNDP and Japan International Cooperation Agency (JICA). Reiko was with the Mission of Japan to International Organizations in Geneva as a researcher/ advisor for environmental organizations including the Ramsar Convention on Wetlands. Reiko has been involved in project development and project management for natural resources funded by the Global Environment Facility (GEF) and by JICA in countries such as Botswana, Mauritius, Solomon Islands, Malaysia, Timor-Leste, Solomon Islands, Palau, and Kyrgyzstan. Through her work on project development and management, she has acquired experience on issues of natural resources management, including wetlands, especially at the field level and advising national governments.